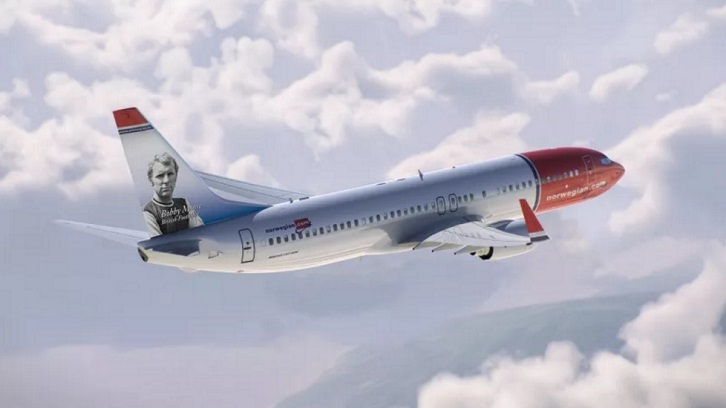 Award-winning airline Norwegian are to make Bobby Moore their latest tail fin hero. The great man’s image will appear on the tail fin of airline’s brand new Boeing 737-800 plane later this year. The announcement was made on Football Shirt Friday – the fundraising initiative that helps fund life-saving research into bowel cancer through the Bobby Moore Fund for Cancer Research UK. Mooro is the fourth British hero to be immortalised on a Norwegian tail fin, following children’s author Roald Dahl, pioneering pilot Amy Johnson and aviation maverick Sir Freddie Laker. Norwegian Chief Commercial Officer Thomas Ramdahl explained why Europe’s best low-cost carrier took the decision to honour the Hammers legend. Jørn Utzon (1918-2008), a Danish architect, most notable for designing the Sydney Opera House in Australia. Edvard Munch (1863-1944), a world-famous Norwegian painter and graphic artist, most notable for the painting “Scream”. Christian Krohg (1852-1925), a Norwegian painter, writer, illustrator and journalist. Oda Krohg (1860-1935), a Norwegian painter and a central figure in the cultural and political movement “The Christiania Bohemians”. Gustav Vigeland (1869-1943) is Norway’s most famous sculptor. John Bauer (1882–1918), a Swedish painter and illustrator. Carl Larsson (1853-1919), a Swedish painter and interior designer. Max Manus (1914-1996), an important member of the Norwegian resistance movement during World War II. Fredrikke Qvam Marie (1843-1938), a Norwegian feminist activist from Steinkjer. Gunnar Sønsteby (1918-2012), a Norwegian resistance fighter during World War II. Edvard Grieg (1843-1907), regarded as Norway’s greatest composer during the Romantic period. Greta Garbo (1905-1990), a Swedish film actress who became an international star and icon during Hollywood’s silent and classic periods. Evert Taube (1890-1976), a Swedish writer, singer, composer and painter. Ole Bull (1810-1880), a violinist and composer who is often referred to as the first Norwegian international star. Erik Bye (1926-2004), a Norwegian broadcaster, author, poet and actor. Ivo Caprino (1920-2001), Norwegian film director and producer, animator and author. Asta Nielsen (1881–1972), a Danish silent film actress. Kirsten Flagstad (1895–1962), one of the greatest singers of her time and become one of Norway’s most famous women internationally. Wenche Foss (1917–2011), a leading Norwegian actress of stage, screen and television. Geirr Tveitt (1908-1981), one of Norway’s most distinctive, colourful and well-educated composers. Jenny Lind (1820-1887), a Swedish opera singer, known as the “Swedish Nightingale”. Christina Nilsson (1843-1921), a Swedish soprano with a golden voice and marvellous stage charisma. Povel Ramel (1922-2007), a Swedish musician, composer, author, cabaret artist and actor. Victor Borge (1909-2000), a Danish comedian, pianist and conductor. Hans Christian Andersen (1805-1875), often referred to by his initials, H. C. Andersen was a Danish author and poet, best known for his children’s stories “The Steadfast Tin Soldier”, “The Snow Queen”, “The Little Mermaid”, “Thumbelina”, “The Little Match Girl” and “The Ugly Duckling”. Peter Christen Asbjørnsen (1812-1885), a Norwegian writer, folklore collector and scientist. André Bjerke (1918-1985), a Norwegian writer, poet and orator. Bjørnstjerne Bjørnson (1832-1910), a Norwegian writer, poet and commentator. Camilla Collet (1813-1895), a Norwegian author, writer and feminist activist. Thorbjørn Egner (1912-1990), a popular Norwegian artist and writer. Henrik Ibsen (1828-1906), a Norwegian playwright, by many considered to be the greatest since William Shakespeare. Jørgen Moe (1813-1882), a Norwegian writer, folklore collector, poet and bishop. Amalie Skram (1846-1905), a Norwegian writer and feminist who gave a voice to women with her naturalist writing. Sigrid Undset (1882-1949) received the Nobel Prize in Literature in 1928 “for her powerful descriptions of life in the Nordic countries in the Middle Ages”. Aasmund Olavson Vinje (1818-1870), a Norwegian author and journalist with a law background. Henrik Wergeland (1808-1845), a Norwegian writer, most celebrated for his poetry, but also a prolific playwright, debater, historian and linguist. Elsa Beskow (1874-1953), a Swedish writer and illustrator best known for her beautiful children’s books. Selma Lagerlöf (1858-1940), a Swedish author and the first female writer to win the Nobel Prize in Literature. Karen Blixen (1885-1962), a Danish writer who for many years lived in Africa and worked as a manager of a coffee farm in Kenya. Georg Brandes (1842-1927), a Danish critic and literary scholar who had a major influence on Scandinavian literature. Minna Canth (1844-1897), a Finnish writer and social activist. Johan Ludvig Runeberg (1804-1877) is the national poet of Finland. Ludvig Holberg (1684-1754), a Norwegian-Danish author. Aksel Sandemose (1899-1965), a Danish-Norwegian author. Søren Kierkegaard (1813-1855), a Danish philosopher, theologian and psychologist who is often referred to as the father of existentialism and the biggest Danish philosopher. Amy Johnson (1903-1941), was a British aviatrix and was the first female pilot to fly alone from Britain to Australia. Sir Freddie Laker (1922 – 2006) was a British aviation entrepreneur. He was one of the first airline owners to adopt the “no-frills” airline business model. Roald Amundsen (1872-1928), one of the greatest polar explorers of all time. Aril Edvardsen (1938-2008),a Norwegian evangelical preacher and missionary. Helmer Hanssen (1870-1956), a Norwegian polar explorer. Thor Heyerdahl (1914-2002), a Norwegian experimental archaeologist, author and adventurer. Fridtjof Nansen (1861-1930), a Norwegian polar explorer, discoverer, diplomat and scientist. Gidsken Jakobsen (1908-1990), one of Norway’s biggest aviation pioneers. Knud Rasmussen (1879-1933), a Danish-Greenlandic polar explorer, national hero and author. Otto Sverdrup (1854-1930), one of Norway’s leading polar explorers. Ludvig Walentin Karlsen (1935-2004), a Pentecostal preacher who, together with his wife established the foundation Pinsevennenes Evangeliesenter. Carl von Linné (1707-1778), an eminent Swedish botanist, physician and zoologist. Niels Henrik Abel (1802-1829), a Norwegian mathematician. Sam Eyde (1866-1940), a Norwegian engineer and industrialist. Kristian Birkeland (1867-1917), a Norwegian physicist. Anders Celsius (1701-1744), a Swedish astronomer, physicist and mathematician. Piet Hein (1905-1996), a Danish mathematician, engineer, poet and inventor. Tycho Brahe (1546-1601), a Danish astronomer. Jens Glad Balchen (1926-2009), a Norwegian engineer. Vilhelm Friman Koren Bjerknes (1862-1951), a Norwegian physicist and meteorologist. Helge Ingstad (1899-2001), a Norwegian lawyer, writer and scientist. Hans Christian Ørsted (1777-1851), a Danish physicist and chemist. Robert Frederick Chelsea “Bobby” Moore OBE (12 April 1941 – 24 February 1993) was an English professional footballer. He was captain of the England team that won the 1966 World Cup. He is widely regarded as one of the greatest defenders of all time and is a member of the World Team of the 20th Century. Sonja Henie (1912-1969), achieved international fame through her three Olympic gold medals, ten World Championships and six European championships in figure skating, as well as later on becoming one of America’s most popular actresses. ← Sakho issue needs sorting out NOW! Let’s have a poll. Which tail fin picture did we like the best?